Like its namesake, Joan Jett, the Joan Medical ID Wrap is dramatic, cutting-edge, and all kinds of rock’n’roll. 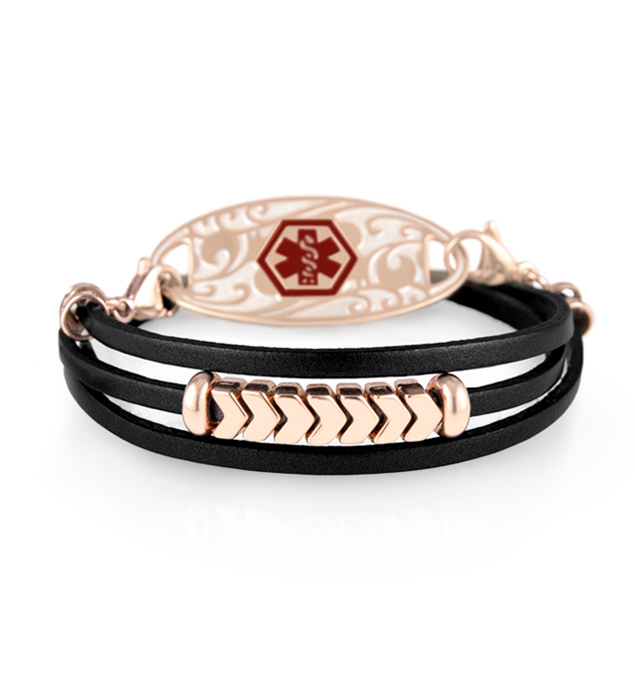 Joan is a leather medical ID wrap bracelet featuring metallic, jet black leather with rose gold chevron accents for a sleek, chic look. The Joan Medical ID Wrap stacks beautifully with your favorite cuffs and watches, or looks great by itself as an edgy statement piece. Handcrafted by our Kansas City artisans and always adjustable for a perfect fit, Joan is a stylishly simple med alert wrap you’ll love to wear. Whether you or your loved ones wear a medical alert bracelet for Celiac disease, heart conditions, lymphedema, autoimmune diseases, a history of weight loss surgery, or any other medical condition or treatment consideration, wrap bracelets are a terrific option. Adjustable and on-trend, wrap medical ID bracelets feature custom-engravable medical ID tags, so they’re truly made just for you, and their added chain allows for sizing flexibility which is extremely beneficial for those with fluctuating weights or wrist sizes.